Definition at line 46 of file llviewerinventory.h. Definition at line 49 of file llviewerinventory.h. Definition at line 119 of file llviewerinventory.cpp. Definition at line 60 of file llviewerinventory.cpp. Definition at line 77 of file llviewerinventory.cpp. References LLInventoryItem::mInventoryType, LLInventoryObject::mName, LLInventoryObject::mParentUUID, and LLInventoryObject::mUUID. 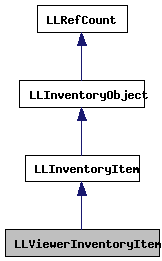 Definition at line 90 of file llviewerinventory.cpp. Definition at line 96 of file llviewerinventory.cpp. References copy(), llendl, llwarns, mIsComplete, and LLInventoryObject::mUUID. Definition at line 107 of file llviewerinventory.cpp. References LLInventoryItem::copy(), llendl, llwarns, mIsComplete, and LLInventoryObject::mUUID. Definition at line 139 of file llviewerinventory.cpp. References LLViewerInventoryItem(), and LLPointer< Type >::notNull(). Definition at line 131 of file llviewerinventory.cpp. References LLInventoryItem::copy(), mIsComplete, mTransactionID, and LLUUID::setNull(). Definition at line 124 of file llviewerinventory.cpp. References LLInventoryItem::copy(), mIsComplete, and mTransactionID. 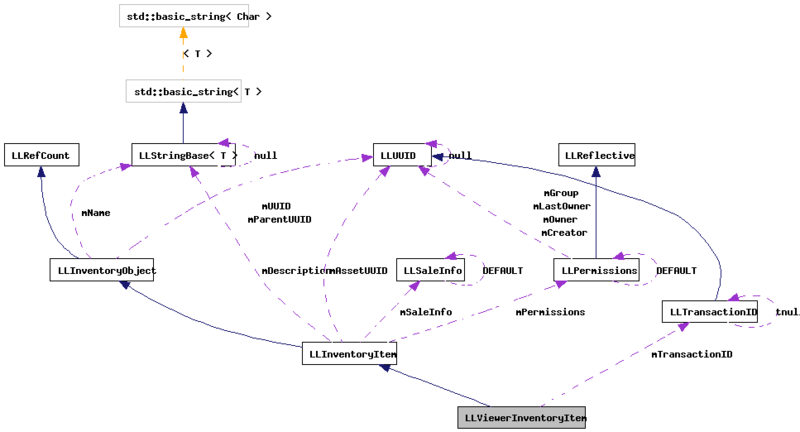 Referenced by LLViewerInventoryItem(), and LLInventoryModel::updateItem(). Definition at line 277 of file llviewerinventory.cpp. References LLPermissions::exportFile(), LLInventoryType::lookup(), LLAssetType::lookup(), LLInventoryItem::mCreationDate, LLInventoryItem::mInventoryType, LLInventoryObject::mName, LLInventoryObject::mParentUUID, LLInventoryItem::mPermissions, LLInventoryObject::mType, LLInventoryObject::mUUID, LLUUID::toString(), and UUID_STR_LENGTH. Definition at line 200 of file llviewerinventory.cpp. References LLMessageSystem::addUUID(), gAgent, LLAgent::getID(), LLPermissions::getOwner(), LLAgent::getSessionID(), gMessageSystem, llendl, llwarns, mIsComplete, LLInventoryItem::mPermissions, LLInventoryObject::mUUID, LLMessageSystem::newMessage(), LLMessageSystem::nextBlock(), and LLAgent::sendReliableMessage(). Referenced by LLItemBridge::selectItem(), LLPreviewGesture::show(), and LLWearable::writeToAvatar(). Definition at line 124 of file llviewerinventory.h. Referenced by LLViewerObject::saveScript(), and LLViewerObject::updateInventory(). Definition at line 254 of file llviewerinventory.cpp. References LLInventoryItem::importFile(), mIsComplete, and TRUE. Definition at line 269 of file llviewerinventory.cpp. Definition at line 262 of file llviewerinventory.cpp. References LLInventoryItem::importLegacyStream(), mIsComplete, and TRUE. Definition at line 111 of file llviewerinventory.h. Referenced by LLToolDragAndDrop::dad3dActivateGesture(), LLToolDragAndDrop::dad3dGiveInventory(), LLToolDragAndDrop::dad3dGiveInventoryObject(), LLToolDragAndDrop::dad3dRezAttachmentFromInv(), LLToolDragAndDrop::dad3dRezFromObjectOnLand(), LLToolDragAndDrop::dad3dRezFromObjectOnObject(), LLToolDragAndDrop::dad3dRezObjectOnLand(), LLToolDragAndDrop::dad3dRezObjectOnObject(), LLToolDragAndDrop::dad3dRezScript(), LLToolDragAndDrop::dad3dTextureObject(), LLToolDragAndDrop::dad3dUpdateInventory(), LLToolDragAndDrop::dad3dWearItem(), LLFolderBridge::dragItemIntoFolder(), LLPanelEditWearable::draw(), LLToolDragAndDrop::dropObject(), LLAttachObject::handleEvent(), inventory_offer_callback(), LLPanelEditWearable::onBtnRandomize(), LLPreview::onCommit(), LLFloaterProperties::onCommitPermissions(), LLWearableBridge::openItem(), LLObjectBridge::performAction(), LLPreviewGesture::refresh(), LLItemBridge::selectItem(), LLPanelEditWearable::setSubpart(), LLPreviewGesture::show(), LLFloaterCustomize::updateInventoryUI(), LLFloaterProperties::updateSaleInfo(), LLFloaterCustomize::updateScrollingPanelUI(), LLToolDragAndDrop::willObjectAcceptInventory(), and LLWearable::writeToAvatar(). Definition at line 235 of file llviewerinventory.cpp. References _PREHASH_CRC, _PREHASH_CreationDate, _PREHASH_Description, _PREHASH_Flags, _PREHASH_FolderID, _PREHASH_InvType, _PREHASH_ItemID, _PREHASH_Name, _PREHASH_TransactionID, _PREHASH_Type, LLMessageSystem::addS32Fast(), LLMessageSystem::addS8Fast(), LLMessageSystem::addStringFast(), LLMessageSystem::addU32Fast(), LLMessageSystem::addUUIDFast(), LLInventoryItem::getCRC32(), LLInventoryItem::mCreationDate, LLInventoryItem::mDescription, LLInventoryItem::mFlags, LLInventoryItem::mInventoryType, LLInventoryObject::mName, LLInventoryObject::mParentUUID, LLInventoryItem::mPermissions, LLInventoryItem::mSaleInfo, mTransactionID, LLInventoryObject::mType, LLInventoryObject::mUUID, LLSaleInfo::packMessage(), LLPermissions::packMessage(), and type. Referenced by LLToolDragAndDrop::dropObject(), and updateServer(). Definition at line 150 of file llviewerinventory.cpp. References _PREHASH_AgentData, _PREHASH_AgentID, _PREHASH_InventoryData, _PREHASH_ItemID, _PREHASH_RemoveInventoryItem, _PREHASH_SessionID, LLInventoryModel::accountForUpdate(), LLMessageSystem::addUUIDFast(), gAgent, LLAgent::getID(), LLAgent::getSessionID(), gInventory, gMessageSystem, llendl, llinfos, LLInventoryObject::mParentUUID, LLInventoryObject::mUUID, LLMessageSystem::newMessageFast(), LLMessageSystem::nextBlockFast(), and LLAgent::sendReliableMessage(). Definition at line 112 of file llviewerinventory.h. Definition at line 230 of file llviewerinventory.cpp. Referenced by LLAgent::addWearabletoAgentInventoryDone(), LLPreviewNotecard::onSaveComplete(), and LLPreviewGesture::onSaveComplete(). Definition at line 222 of file llviewerinventory.cpp. References mIsComplete, TRUE, and LLInventoryItem::unpackMessage(). Definition at line 295 of file llviewerinventory.cpp. References _PREHASH_AgentData, _PREHASH_AgentID, _PREHASH_FolderID, _PREHASH_InventoryData, _PREHASH_ItemID, _PREHASH_MoveInventoryItem, _PREHASH_SessionID, _PREHASH_Stamp, LLMessageSystem::addBOOLFast(), LLMessageSystem::addString(), LLMessageSystem::addUUIDFast(), gAgent, LLAgent::getID(), LLAgent::getSessionID(), gMessageSystem, LLInventoryObject::mParentUUID, LLInventoryObject::mUUID, LLMessageSystem::newMessageFast(), LLMessageSystem::nextBlockFast(), NULL, and LLAgent::sendReliableMessage(). Definition at line 168 of file llviewerinventory.cpp. References _PREHASH_AgentData, _PREHASH_AgentID, _PREHASH_CallbackID, _PREHASH_InventoryData, _PREHASH_SessionID, _PREHASH_TransactionID, _PREHASH_UpdateInventoryItem, LLInventoryModel::accountForUpdate(), LLMessageSystem::addU32Fast(), LLMessageSystem::addUUIDFast(), gAgent, LLAgent::getID(), LLPermissions::getOwner(), LLAgent::getSessionID(), gInventory, gMessageSystem, llendl, llerrs, llwarns, mIsComplete, LLInventoryObject::mParentUUID, LLInventoryItem::mPermissions, mTransactionID, LLMessageSystem::newMessageFast(), LLMessageSystem::nextBlockFast(), packMessage(), and LLAgent::sendReliableMessage(). Definition at line 127 of file llviewerinventory.h. Referenced by copy(), fetchFromServer(), importFile(), importFileLocal(), importLegacyStream(), isComplete(), LLViewerInventoryItem(), setComplete(), unpackMessage(), and updateServer(). Definition at line 128 of file llviewerinventory.h. Referenced by copy(), getTransactionID(), packMessage(), setTransactionID(), and updateServer().